Corofin captain Kieran Fitzgerald celebrates after his team defeat Tuam Stars to win the County Senior Football final at Tuam on Sunday. There was a tremendous athmosphere around Tuam Stadium last Sunday afternoon before throw-in for the senior game. The healthy queues of people at the turnstiles were all in great form and full of good humoured banter and there was great colour to be seen all around the ground. The stand was full and it was wonderful to see so many young people at the game. Galway football at all levels and all grades needs to focus on attracting young people to their games. The good and positive work done by both clubs in focusing on the children in the local national schools was plain to see. The novelty factor of a Tuam and Corofin final was another major factor and the town had really got behind their team over the past month. No doubt the vast majority of neutrals would have loved to have seen a county final victory for the Stars and that is completely understandable. Players like their inspiring captain Tony Costello has soldiered in the Tuam colours for 15 years or more and nobody would begrudge him a county senior medal. When one player is going for his 11th winner’s medal and the other man is going for his first, it is very difficult not to side with the underdog. However, sport does not work that way and the Corofin players were keen not to have a repeat of last year’s county final defeat. As a unit they were very highly motivated to get back onto the winner’s plinth and they were out of the blocks like highly tuned greyhounds. Oddly Tuam decided to play into the wind even though they had won the toss and handing the early initiative to Corofin was a dangerous strategy. It back-fired badly on Alan Flynn’s men as Corofin ran them ragged for the first 30 minutes. County player Alan Burke sallied up the field from centre-back in the first minute and pointed with supreme confidence from distance. That score, and the authority he scored it with, gave Corofin a real boost and from there to the end of the first half they ripped Tuam apart. and Kieran Comer added another with an audacious effort. Justin Burke who impressed at full-forward and Gary Delaney also found the range and the side’s experienced free-taker Alan O’ Donovan was in scintillating form. Alan had one of those games that most people only dream of. He kicked 10 points — five in each half — and the two he scored from play in the first half were sensational efforts. He was a worthy man-of-the-match, although Kieran McGrath also had an outstanding game and Daithí Burke also showcased the awesome potential that he has for gaelic football. The first half was an outstanding display of total team football by Brian Silke’s outfit. They led by 0-11 to 0-2 at the small whistle and it could have been more only for seven wides, a few harsh referring calls on Kieran Comer in particular, and the fact that they sprurned two or three goal scoring opportunities. Tuam to their credit did not cave in completely in that half and David Morris had to be sharp to make a good save off Jamie Murphy. It was a different story in the second half. David Connern was moved to midfield and caught some wonderful ball and John Lawless also upped his work-rate. With nothing to lose the whole red and white team tore into Corofin and Gary O’Donnell gave them some belief with a superb individual point. Shane Gaffney, Noel Henry and Jamie Murphy also raised flags and when O’Donnell lobbed home a three-pointer with fifteen minutes left it narrowed the gap to 0-14 to 1-6. Corofin got really sloppy after that goal and when team captain Kieran Fitzgerald hauled down Conor Doherty in the square, the critical moment of the game had arrived. If Tuam scored, it would leave the score-board at 0-14 to 2-6 and Tuam were flying it. Nobody can say with certainty what would have happened if Tuam had had goaled again as the game’s energy was completely with Tuam at that stage. As Kerry proved conclusively in the All-Ireland final this year, defeat can be snatched from the jaws of victory in a matter of minutes. David Morris guessed correctly, dived right and saved Shane Gaffney’s penalty. Tuam’s slim chance of getting anything out of the game and their first county final since 1995 evaporated immediately after that save. Their wind was gone. They did not score after again. Corofin did, with O’ Donovan finding the target twice. Ominously, he was his team’s only scorer in the second half. 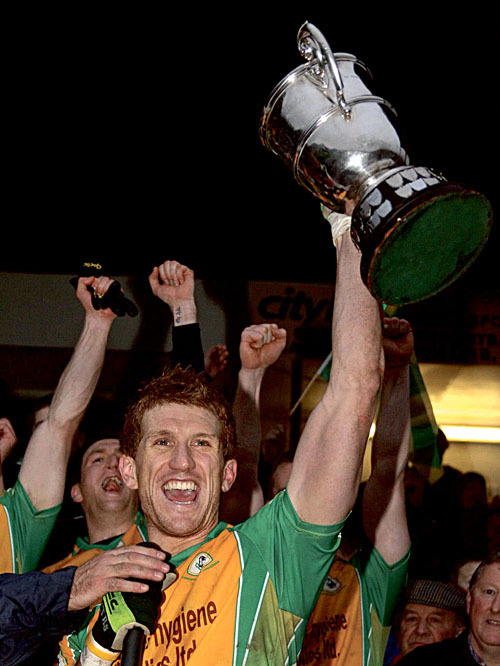 Last Sunday was title number 14 for Corofin and their eleventh since 1991. It is a golden era for their club and their supporters. One player who has played a role in all their triumphs is Trevor Burke who made his debut in 1989 as a speedy 16-year-old. That he is still involved and making a contribution to the cause 22 years later is a terrific achievement. When you are winning, the sacrifices are easier to make. Corofin do not have much chance to rest on their laurels as they head up to McHale Park in Castlebar on Sunday (2.30pm ) to take on the Mayo county champions, Ballintubber in the Connacht semi-final. Corofin: D Morris, P Kelly, K Fitzgerald (Cpt ), K McGrath; M Comer, A Burke (0-1 ), G Delaney (0-1 ), Daithi Burke, G Higgins, G Sice, Damien Burke (0-2 ), A O’Donovan (0-10, 6fs, 1 ‘45 ), M Lundy, J Burke (0-1 ), K Comer (0-1 ). Subs: R Steede for K Comer (45 ), R Burke for Damien Burke (60 ), I Burke for Lundy (62 ), T Burke for J Burke (63 ), A Donnellan for Daithi Burke, (63 ). Tuam Stars: J Trayers, D O’Rourke, I McGough, A Tierney, D Connern, T Costello, G O’Donnell (1-1 ), B Devaney, J Lawless, D Byrne, J Murphy (0-1 ), Henry (0-1 ), S Curtin (0-2, 1f ), C Doherty, S Gaffney (0-1 ). Subs: R Gaffney for Devaney (30 ), D Marley for Byrne (42 ), D Murray for Curtin (58 ), G Cunniffe for S Gaffney (58 ).